​Anyone wishing to learn how to meditate is welcome to attend this class, held immediately after the second Service at 12:10 pm in Lower India Hall. 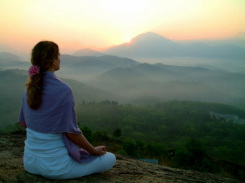 You will learn some of the basic principles for starting your own meditation practice, practices that can help calm the mind and interiorize the focus to a higher consciousness. All are welcome to this class held in the Temple for those new to meditation. Those who just want to meditate - we suggest you meditate at the back of the chapel. Separate classes for men and women are offered each week in lower India Hall. All levels are welcome to attend. Free parking is available adjacent to the temple. Participants are advised to bring clothing suitable for gymnastics, and a blanket or mat. You may also want to bring water. There is a suggested donation of $7.00 per session. Women's Hatha Yoga class: Tuesdays at 6:00 p.m.
Men's Hatha Yoga class: Tuesdays at 7:30 p.m.
First Wednesday of the month, 7:30 - 9:30 p.m.
Sadhana Sangha is the Young Adults group for men and women at Hollywood Temple comprised of SRF Kriyabans, Lessons Students and friends. Sadhana Sangha is a Sanskrit name meaning, “a group centered around the Guru’s liberating truths, and techniques of meditation.” The purpose of the group is to come together on a monthly basis in spiritual fellowship to discuss the application of Master’s teachings in daily life, creating a place to support each others' spiritual growth. We meet with an SRF monastic in India Hall on the first Wednesday of the month, from 7:30 p.m. to 9:30 p.m. The evening begins with a prayer, devotional chanting and silent meditation. We then share in-depth insights regarding applying Paramahansa Yogananda’s teachings in our daily lives. This is followed by light refreshments. Additionally, we periodically gather for picnics and informal kirtan meditations outdoors. All between the ages of 20 and 40 are welcome to attend. Please see the Calendar for details about our meeting this month. Senior Devotee Group - Fourth Sunday of the month, 1:00 - 2:30 p.m.
Hollywood Temple has a Senior devotee group for those 75 and older. Seniors are welcome to join our monthly meeting held in upper India Hall. Come join us for an afternoon of fellowship. The meetings involve light refreshment and socialization at the beginning, a topical study of Master’s teachings, and closing with group meditation. The focus of the group is the 4th ashrama, namely, disengaging from worldly pursuits, transcending the challenges of older age, and living in attunement with God and Guru. Please see the Calendar for details about our meeting this month. If you have any questions or need assistance in getting to the meeting, please contact the Temple at (323) 661-8006. 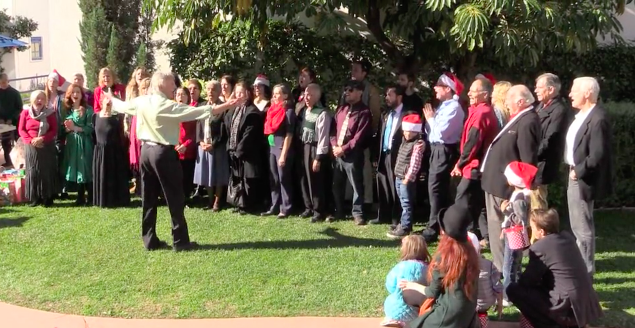 The Temple Singers are part of Hollywood Temple’s Community Outreach. They visit local convalescent homes generally on the first Sunday of the month at 1:30 p.m. and rehearse on the other Sundays from 1:30 - 3:00 p.m. in lower India Hall. They look forward to seeing you as they endeavor to share Divine Mother’s love with those who often feel lonely and forgotten.